Have you read the article in the Bangor Daily News about the National Science Foundation (NSF) Grant that supports STEM through community libraries? I only know what I have read in the article but I am very excited that support for STEM is taking many shapes. We are fortunate to have one of our Maine community libraries included as one of the 20 sites for this NSF work! All of these efforts help us to realize the vision of the Framework. I will be sure to share more information as it is available. A Framework for K-12 Science Education and Common Core State Standards (CCSS) for ELA expect that all students can find meaning in Informational texts. Starting at grades 7-12, the CCSS for ELA shift the focus away from opinion-centered writing toward evidence-based writing and require that students ask increasingly sophisticated questions about texts. [i] The language and intent of the Framework is consistent with the CCSS for ELA. A Framework for K-12 Science Education and the Next Generation Science Standards also expect students at the 7-12 grade span to ask clarifying and probing questions of science texts and phenomena (Practice 1) and expect students to understand, communicate, and apply the science information of texts to the phenomena and ideas in the world around them (Practice 8). [ii] By grade 12 students should be able to evaluate the science evidence that an author presents to support a claim, including the value of any visual supports (photos, charts, graphs) that the author presents. Teachers across Maine and the country are trying to make sense of and implement these ideas. The list below provides tips to help students gain the most from informational science texts. The list is adapted from work being done by teachers at the Doughty Middle School in Bangor, Maine. The teachers at the Doughty School ask students to tag the text as they read with sticky notes of different colors for each of the categories below. I thank them for sharing their ideas with me and allowing me to share those ideas with you. You can also download the TIPS as a word document (TIPS for Supporting Students Understanding of Informational Texts). List something you already know about this topic. Make an observation about the cover or title page. Write a prediction of about the main point of the text and explain your reasoning for the prediction [inference and evidence]. Identify the author’s primary and secondary claims, and significant supporting evidence. Write 3 observations about the graphics. Which graphics support understanding? Why? Find examples of graphics with distinct purpose. Does the caption aid understanding or confuse? Note words or phrases that are specific to the topic, especially any that are used repeatedly in the text. Explain the meaning of the words in the context of science. Evaluate the value of the information presented in a broader context of what you know about science. Does the information help you to make sense of data you have collected? Do the author’s claims make sense in relationship to other data that is commonly accepted by scientists? Do the author’s claims and evidence help us to understand and answer new questions? What new information does the author add to the field? [ii] A Framework for K-12 Science Education. 2011. pp. 40 – 80. Last week Christine Anderson-Morehouse, presented a session on Word Knowledge at the Department’s K-12 Summer Literacy Institute: Transition Planning for the Common Core State Standards. Christine is both a longtime science education consultant and the director at Midcoast Professional Development Center where her work has included supporting several partner schools in a statewide, five-year Maine Content Literacy Project grant. I am delighted that she agreed to share her insights with us in the entry that follows… Thank you, Christine. Language is at the core of the Practices in the Framework for K-12 Science Education, especially Practice 6 (Constructing Explanations and Designing Solutions); Practice 7 (Engaging in Argument from Evidence) and Practice 8 (Obtaining, Evaluating and Communicating Information). The Common Core State Standards for ELA / Literacy in History/Social Studies, Science and Technical Subjects make direct connections to Science. We see this link in the Common Core State Standards for Literacy in History/Social Studies, Science and Technical Subjects (CCSS), the Language Standards, which are intended to be embedded across all other CCSS standards including reading, writing, listening and speaking. Although we in STEM education might not think of ourselves as literacy teachers, it’s imperative that we incorporate effective word work into our daily instruction. I am fascinated by the related and complementary research into language/vocabulary instruction that’s described in the Common Core documents (for example, CCSS Appendix A. Acquiring Vocabulary p. 32). Academic Language and Background Knowledge: Which Words? In science, we know that students come to the classroom with preconceptions about how the world works. It’s our job to provide scaffolded experiences (both hands-on and through reading) to engage students’existing understandings and lead them gradually to new concepts in order for them to learn in a way that “sticks”. So, too, must we scaffold student use of language. All students and especially struggling students need explicit support if they are to understand and use Academic Language, both the “Tier 2 Words” (general academic words such as “contrast”, “analyze”, “note”–words that are frequently used in school but rarely explicitly taught) and the “Tier 3 Words” (domain-specific terminology that represents both brand new concepts (“density”) and terminology that extends existing conceptual knowledge (the term “raptor” as applied to an already-understood concept of “bird”). Our choice of Tier 3 words should assuredly be based on the standards in science. In selecting the general academic words that we’ll take the time to teach, we’d be wise to work with our colleagues across the curriculum and identify the Tier 2 words to emphasize at each grade level in each subject. It is widely accepted among researchers that the difference in students’ academic vocabulary levels is a key factor in disparities in academic achievement and that students struggle in school or drop out of college not because they can’t read (decode letters) but rather, because they struggle to unlock the meaning of these more general, academic words. The AWL (Academic Word List) consists of 570 of the most common terms used across disciplines organized by frequency of use. An excellent book by Amy Benjamin, Vocabulary at the Center, includes similar word lists that are organized by categories of meaning. Either of these resources, combined with the descriptions of science practices in A Framework for K-12 Science Education, can support cross-disciplinary discussions and decision-making about which words we’ll emphasize in the science classroom. Historically there has been an emphasis on the “assign/define/test” mode of studying word lists. These words were often the bold words from textbook chapters. Research now tells us that words won’t stick when instruction follows this practice because it involves little in the way of student engagement nor experiences that build long-term memory. Rather, students should have guidance so that they can create their own linguistic and non-linguistic representations in order gradually to shape their understandings of word meaning. In order to support this learning, teachers must provide multiple and varied exposure over time with repeated opportunities for students to interact with one another about the words that they’re learning. Learning word parts (roots,and prefixes and suffixes)and use of games—playing with words—can increase a student’s probability for academic success. 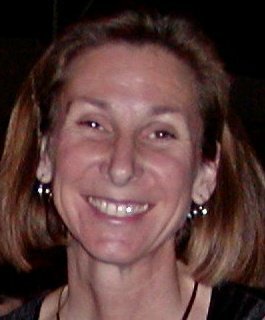 Two valuable, general resources about research-based vocabulary instruction are an article by Robert Marzano about a six-step vocabulary process and an entry by Susan Ebbers on the Vocabulogic blog (scroll down to a list of “effective and engaging vocabulary practices”). Specific to science, I’ve enjoyed using some of the practical classroom strategies such as the Frayer Model, Synectics and many other strategies described in Page Keeley’s Science Formative Assessments book. Strengthening STEM learning requires the integration of literacy as described in the standards of the Common Core and the Practices of the Framework. This week ASCD featured an online article by a D.C. area biology teacher. The writer addressed the need for all teachers to support the development of student literacy. Science and literacy connections feature prominently in A Framework for K-12 Science Education. We also see the literacy/science connection highlighted in the Common Core State Standards for English Language Arts. use literacy strategies to enhance the learning of science. As my Maine Department of Education English Language Arts colleagues, Patsy Dunton and LeeAnne Larsen, are quick to point out, this does NOT mean that teachers of science need to become teachers of English Language Arts. However, it does mean that teachers of science need to understand the science/literacy expectations in the Framework and Common Core documents. It also means that teachers of science need to collaborate with teachers of English Language Arts to ensure that literacy expectations for students are consistent and strategies are being used effectively across content areas. We see the science literacy connection clearly in Practices 6, 7, and 8 of the Framework. All three practices describe the interface between science and literacy. Practice 6 points to students being able to construct explanations (for science) and design solutions (for engineering). Practice 7 points to students being able to engage in argument from evidence. And Practice 8 points to students being able to obtain, evaluate, and communicate information. I joined 15 Presque Isle area teachers earlier this week for a workshop on the Scientific and Engineering Practices and Engineering Design. In our conversations about the practices they were quick to note that Practice 8 is not simply another way to say that students are discussing the results of their experiments. Rather, Practice 8 intends that students will interact with and make sense of science media (for example science texts, talks, and videos). This opens the door wide for the application of literacy strategies to support students in making sense of the science ideas. 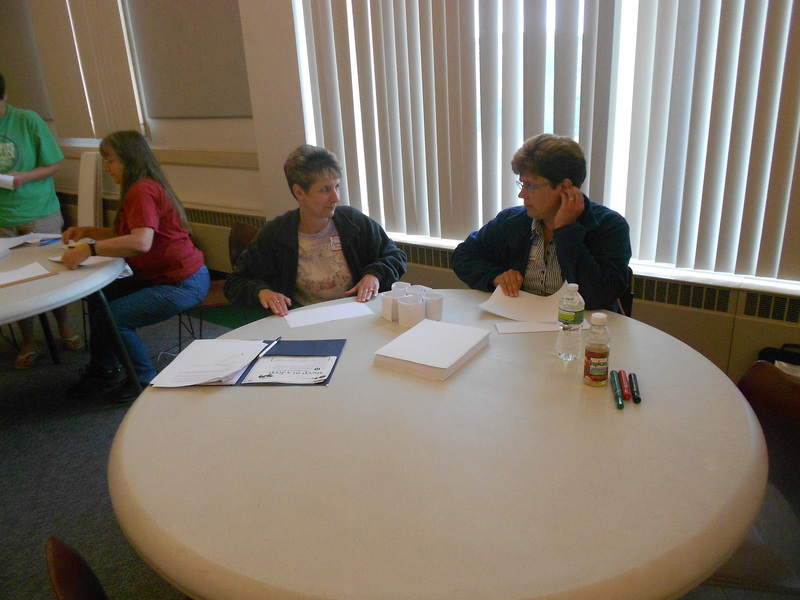 Colleen Good and Shari Ward at the Scientific and Engineering Practices and Engineering Design workshop. 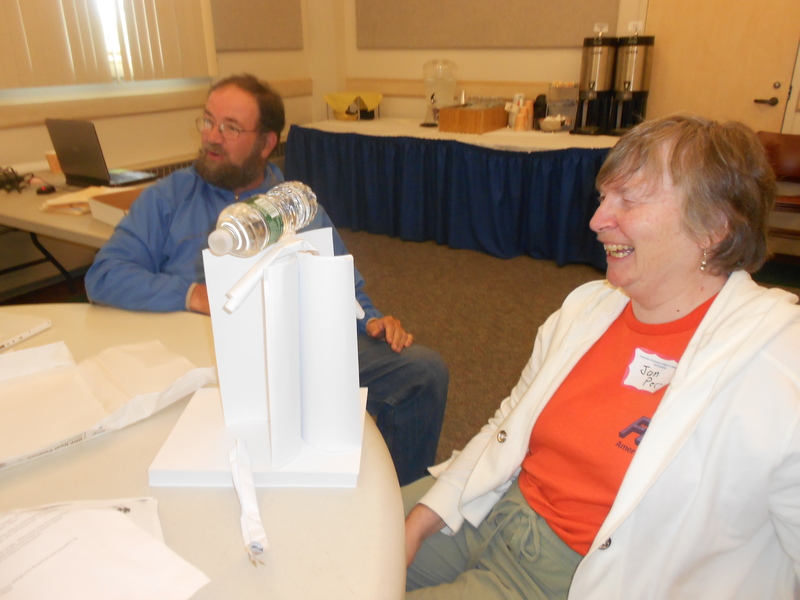 Ernie Easter and Jan Perry at the Scientific and Engineering Practices and Engineering Design workshop.